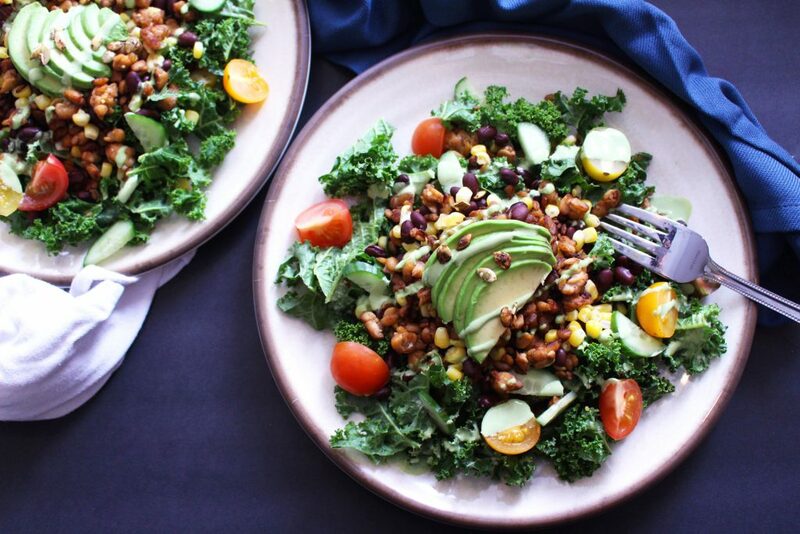 This festive kale taco salad is packed with a total of over 65g of protein thanks to tempeh and black beans, and irresistible when topped with a creamy cilantro-lime tahini dressing! Lately, I have been working out more and trying to get more protein into my diet, and this salad makes the perfect filling dinner for 2 or 3 servings. Who said vegans don’t get enough protein? 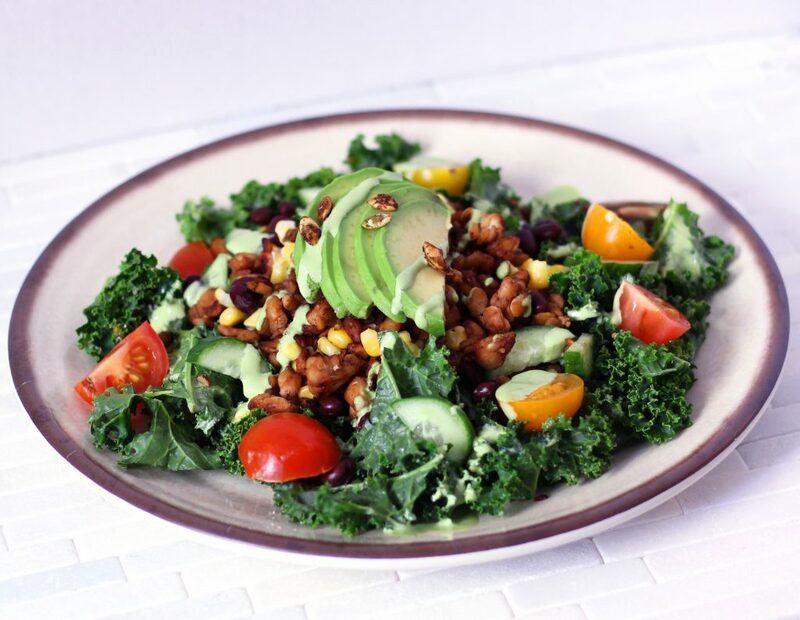 The kale is soft, after being massaged with lime juice, and corn and cherry tomatoes add bright colors and flavors to the salad. I also topped it with creamy avocado and crunchy spiced pepitas! I am so excited to take advantage of the warm weather and plan more outdoor activities and exercises. I have recently been loving outdoor yoga. It is so refreshing to take a few moments away from the stress and noise of our daily lives and focus on our breathing around nature. I hope you enjoy this recipe as much as I do! Don’t forget to comment below if you try this or pin it for later, and tag your recreations on Instagram @zenanzaatar and #zenanzaatar! 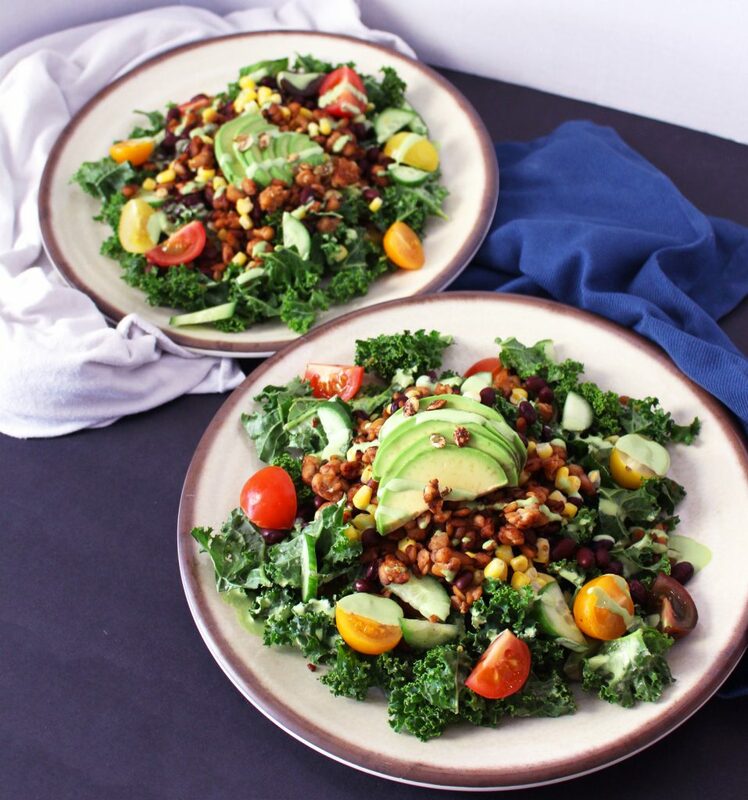 A vegan and gluten-free kale taco salad with taco-flavored tempeh and a creamy cilantro lime tahini dressing! Protein-packed from black beans and tempeh. Massage 1 tbsp lime juice into washed, trimmed kale leaves and place into a salad bowl. Crumble block of tempeh into a medium bowl. Add tamari and lime juice, and stir to coat the tempeh, until it absorbs most of the liquid. Heat olive oil in a medium skillet over medium high heat, and add marinated tempeh. * Add onion powder, cumin, and chili powder. Sauté for about 10 mins, until browned, and remove from heat. Blend all ingredients for cilantro lime tahini in a high speed blender and set aside. 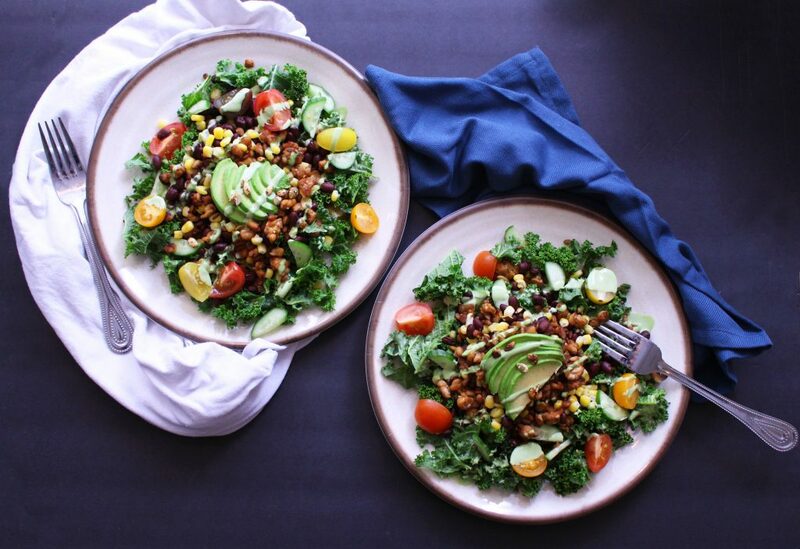 Toss kale leaves with tahini dressing, corn, black beans, cherry tomatoes, and crumbled tempeh. Drizzle extra dressing on top, and top with pepitas and sliced avocado if desired. Enjoy! *Alternatively, heat 2-4 tbsp water in the skillet and sauté the tempeh until it is softened, adding more water if needed.